Recently the American Association of Nurse Anesthetists (AANA) Board of Directors decided to no longer provide financial support to the Anesthesia Patient Safety Foundation (APSF). The AANA board objected to APSF’s decision to publish a summary of the World Health Organization’s (WHO) “Standards for a Safe Practice of Anesthesia” (https://www.apsf.org/article/the-safe-t-summit-and-the-international-standards-for-a-safe-practice-of-anesthesia/) in its February 2019 APSF Newsletter. This 2018 WHO standards policy, unanimously approved by the countries represented in the United Nation’s World Health Assembly, provides countries with guidance on how to improve anesthesia patient safety globally. The World Federation of Societies of Anaesthesiologists championed the acceptance of this important patient safety document. The AANA Board of Directors objected to a set of statements in the WHO standards that (for anesthesia) “its safe provision requires a high level of expertise in medical diagnosis, pharmacology, physiology, and anatomy, as well as considerable practical skill” and “wherever and whenever possible, anesthesia should be provided, led, or overseen by an anesthesiologist . . .” It is notable that this statement had been previously published in June 2018 by Anesthesia & Analgesia as well as the Canadian Journal of Anaesthesia. The AANA requested that APSF retract or modify the summary. After consulting with past and current editors of five of the world’s most preeminent anesthesia journals and speaking with administrators at the WHO, the APSF agreed with their unanimous advice and declined the AANA request to retract or modify the article. 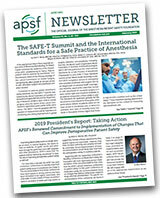 The article as published in the APSF Newsletter is factual, correctly cites the WHO standards, is currently being used by ministries of health around the globe, and is important to improving patient safety worldwide. Subsequently, the AANA Board of Directors decided to no longer financially support APSF’s mission of patient safety. APSF remains dedicated to its basic vision that no one shall be harmed by anesthesia care. We believe that all anesthesia professionals, regardless of their titles and training, play vital roles in providing safe anesthesia and perioperative care. We respect all anesthesia professionals and their important contributions to anesthesia patient safety.